We solve the problem of extending Bird and Paterson’s generalized folds for nested datatypes and its dual to inductive and coinductive constructors of arbitrarily high ranks by appropriately generalizing Mendler-style (co)iteration.Characteristically to Mendler-style schemes of disciplined (co)recursion,the schemes we propose do not rest on notions like positivity or monotonicity of a constructor and facilitate programming in a natural and elegant style close to programming with the customary letrec construct,where the typings of the schemes,however, guarantee termination. For rank 2,a smoothened version of Bird and Paterson's generalized folds and its dual are achieved;for rank 1,the schemes instantiate to Mendler's original (re)formulation of iteration and coiteration. Several examples demonstrate the power of the approach. Strong normalization of our proposed extension of system F ω of higher-order parametric polymorphism is proven by a reduction-preserving embedding into pure F ω. 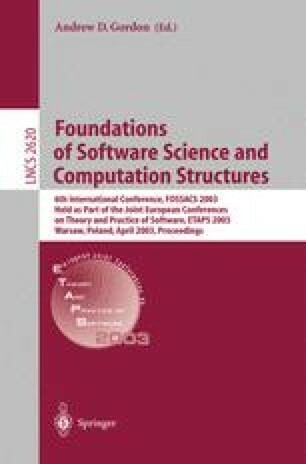 The first author gratefully acknowledges the support by the PhD Programme Logic in Computer Science (GKLI)of the Deutsche Forschungs-Gemeinschaft. The third author is partially supported by the Estonian Science Foundation (ETF)under grant No.4155. He is also grateful to the GKLI for two invitations to Munich;the cooperation started during these visits.